Now is the time for enlivened discourse about unified action, national policy, and the human dimension. The peoples and institutions that inhabit operational environments are always significant to our desired outcomes. 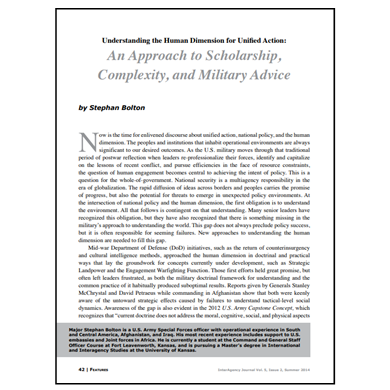 As the U.S. military moves through that traditional period of postwar reflection when leaders re-professionalize their forces, identify and capitalize on the lessons of recent conflict, and pursue efficiencies in the face of resource constraints, the question of human engagement becomes central to achieving the intent of policy. This is a question for the whole-of-government. National security is a multiagency responsibility in the era of globalization. The rapid diffusion of ideas across borders and peoples carries the promise of progress, but also the potential for threats to emerge in unexpected policy environments. At the intersection of national policy and the human dimension, the first obligation is to understand the environment. All that follows is contingent on that understanding. Many senior leaders have recognized this obligation, but they have also recognized that there is something missing in the military’s approach to understanding the world. This gap does not always preclude policy success, but it is often responsible for seeming failures. New approaches to understanding the human dimension are needed to fill this gap. 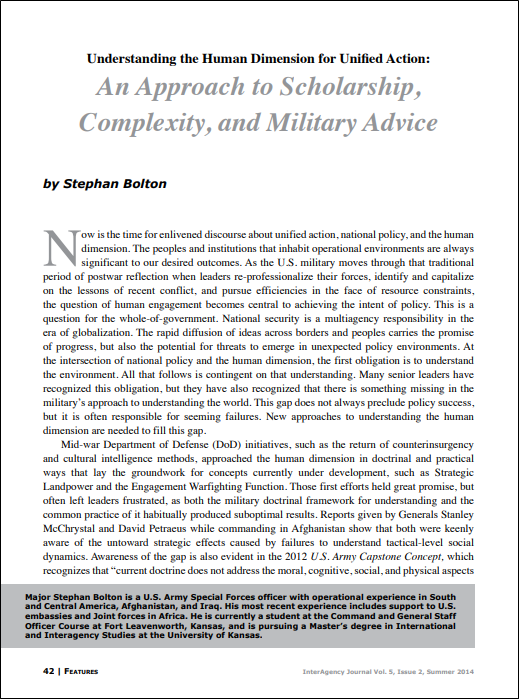 About the Author:Major Stephan Bolton is a U.S. Army Special Forces officer with operational experience in South and Central America, Afghanistan, and Iraq. His most recent experience includes support to U.S. embassies and Joint forces in Africa. He is currently a student at the Command and General Staff Officer Course at Fort Leavenworth, Kansas, and is pursuing a Master’s degree in International and Interagency Studies at the University of Kansas.